﻿ Deal or No Deal? There’s a popular game show on TV called Deal or No Deal. This show is based on an original Dutch show called Miljoenenjacht (Hunt for Millions). All variants of the game are produced by Endermol. The basic concept of the game is that there are twenty-six identical briefcases secretly containing a spectrum of distinct prizes. The value of the prizes ranges from a solitary penny to a million dollars ($0.01 to $1,000,000). At the start of game, a show contestant selects one case (either at random, or through some other non-scientific and superstitious way) to be theirs, and then starts to eliminate other cases in prescribed batches. As cases are eliminated, their prize contents are revealed. At the conclusion of each batch of eliminations, a host (called ”The Banker”) offers to buy the contestant’s case back from him for a sum certain amount. Taking the Bankers offer (deal) ends the game and the player leaves with the offer made by the Banker. A call of “No Deal” commits the player to eliminate the next batch of cases. This process continues until either an offer is taken, or all other cases have been revealed. In the latter case, the contestant leaves with the prize indicated in his originally selected case. (The value of this final prize will be known as, through elimination, all other prizes values will have been revealed). The first is that it is impossible to lose! No matter what happens, the contestant will walk away with a prize (small or otherwise). The second is that the prize structure is clearly defined. The prize pool is defined and locked even before the game starts. 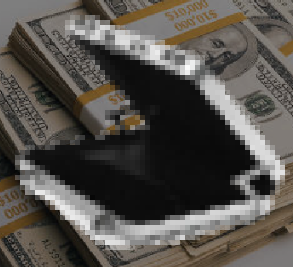 Since the distribution of prizes is initially unknown, the amount of money offered by the Banker changes as cases are revealed. If many high-value cases are eliminated, the banker’s next offers may be lower as it is impossible for these high values to be in the player’s selected case. Similarly, the elimination of low-value cases is advantageous to the player. As more cases are revealed, more information is learned about what could probably be in the player's selected case. Obviously there is a lot of luck involved. It’s a gambling game, but it’s not just a lottery. A contestant makes choices throughout the game. They chose to take deals or not. Is there skill in the game? Is there an optimal strategy? How should the game be played? After selecting his prize case, the player must initially eliminate six cases before receiving his first offer. If the deal is not taken, the player is committed to eliminate the next batch of five cases, then receives another offer. Then four cases, then three, then two. After this, cases are opened singly with an offer after each. Once a player elects to continue the game he must eliminate cases to reach the end of a batch (no matter how ugly things get). There’s a lot of psychology in this game. Web searches and commentary suggest that the Banker does not know the value of the prize in the player's case, so this removes one angle of the game (the Monty Hall complication). The Banker's attempts to manipulate and tease the player (in the interests of making entertaining TV) have to be done without actual knowledge of what is present in the selected case. (If the banker was malicious and knew the player had selected the million dollar case, he might want to make ‘good’ offers to the player to encourage him to take a deal and stop. Alternatively if the case contained the penny, he might consider making ‘poor’ offers in an attempt to keep the player in the game and eliminating higher prizes as he does). Mathematically, the potential payout of the game is easy to calculate. Statisticians call this the Expected Value. Expected value is the outcome that would be obtained if it were possible to play the game an infinite number of times and the results averaged. Every case can be selected with equal probability, so if a case were selected at random and the game played to completion, then this was done over and over and over again, and the results averaged, the expected outcome (gain) would simply be the arithmetic mean of the prize values. This is easy to calculate. If you walk away from the game with more than this amount, you have done well. The Banker does not initially offer you money to not even start playing the game! (That would make for very boring TV). He does not say “Here, take the Expected value of $131,477.54 and thank you for playing!”. Instead he makes you gamble by forcing you to eliminate the first six cases before he will offer to buy your case back. As cases are selected, these prize values are removed. The expected value of the remaining cases changes with every revelation. At any stage, the expected value is easy to calculate, it’s simply the average value of the prizes not yet seen (an easy way to think of this is that when cases are revealed, it’s as if they never existed and all that happens is that you are now playing a slightly smaller game with less cases/prizes). If, at any time, the Banker makes you an offer than is more than the expected value of the unseen cases, it would be in your best interest to take it! (Remember the expected value is what would be obtained, on average, if the game were played from this position an infinite number of times). Again, if the Banker simply offered the expected value it would make for pretty boring TV and so, typically, the Banker makes offers significantly below the expected value (more on this later), which encourages players to continue playing. I’m not sure it’s never happens (I don’t watch a lot of the show on TV), but I’ve never seen the Banker make an offer higher than expected value. The producers of the show make the Banker stingy. This keeps the show more interesting, and makes the games longer (who is going to accept a very poor initial offer when there is, potentially, significantly more money to be earned?). To build the mystery, the Banker is never directly seen, nor heard. He communicates directly to the host of the show via a telephone, and the host broadcasts out the offers. The math is not hard, so clearly the producers know how to calculate the expected value. What appears to happen is that the Banker offers a percentage of the expected value at any stage. There is no published strategy for the Bankers logic (that I could find), but with a little experimentation (and a small amount of sample data) I derived an approximation. More data could produce a better approximation, but it appears that Banker uses such a wide range of values around a potential offer, that his variance dwarfs the value additional precision might give. The producers appear to give the Banker quite a large range to play with. In the interests of entertainment, the Banker appears to often go ‘hot’ and ‘cold’ in an attempt to embolden or inspire action from the player. Initial offers appear pathetically poor. It seems the first offer is typically around 15% of the expected value. I’ve never seen anyone take this offer. Even if all six initial eliminations were high value (and thus the offer would be very low), there is nothing to lose, and you might as well continue. If all six eliminations were low value, why take a ‘pennies on the dollar’ offer when there is so much green left in the field? Even if you reject several high value cases in subsequent rounds, there is still some safety net. 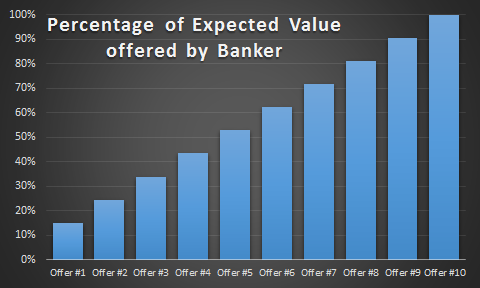 As the offer rounds progress, so does the percentage of expected value the banker appears to offer. In my model, I used a simple linear regression, starting at 15% for the first offer, increasing to 24% of Expected value on the second offer, 34% for the third … and ending at 100% when there is only one case (the Banker would offer you 1:1 when there is only one case left!). With this, we can see that even if there are just two cases left, the banker is not going to offer you a 50:50 deal, but instead somewhere around 91% of the average of two cases (again more on this later). Below is a simulation of the game that follows the above logic and allows you to experiment with how the revelation of a case can change the potential payout significantly. It’s not an implementation of the game; you don’t select a case and play the game, instead you mark out the cases taken, and at each stage it tells you the expected value of the cases left and an approximation for what the Banker may offer at each of his offer rounds (based the linear regression described above). Maybe you can use it to play along when watching the show, and speculate what the Banker might offer based on cases selected? The controls should be pretty obvious, but here are all the details: The Reset button clears the board ready for a new game. Clicking on one of the gold Prize labels is the way to mark that that prize has been eliminated from the game. There are multiple levels of Undo to allow you to step back up the selection tree and return back down again. This allows you to experiment and play “What if?” scenarios. Below the buttons are graphics to show how many cases have been eliminated and how many are still in play. Each blue case depicts an eliminated case. Below the cases are lines that show how many cases need to be eliminated in that round. The yellow part of the bar shows which selection round you are currently in. This will progress as you play the game. To the right of the prize boxes, in large text, is displayed the current Expected value of the board. Above it are the approximations for what the Banker will likely offer at the end of that round. Finally, the rubric in the top right shows the current round and how many open/remaining cases there are. Have fun! This game is not a pure lottery because the player has choice, but there is a huge random component. Clearly the player has no input on the initial distribution, and thus has no way to predict the values and where they will be. A player does, however, have free will to take any deal or continue playing. It’s a gambling game, and we’ve shown that, mathematically, the optimal strategy would be to play until the expected value (or higher) is offered. We also know that the Banker does not pay anywhere near the true expected value! Expected values are helpful if we were playing the game over and over and over (where we could average our winnings over a statistically large denominator), but that is not the situation here. A contestant only gets to play once. If we were allowed to play thousands of times, even if the Banker were stingy and never offered expected value, we could simply hold onto our case to the end and average out at $131,477.54 per game. Strategy with a stingy banker? Different people have different desires, needs, greeds and satisfaction. What is a lot of money to someone is a little to someone else. What is a life changing prize for one contestant, might be a ho-hum prize for another. Economists, in these situations don’t talk about value, but instead talk about something called utility. To my son, a one-off gift of $100 might be life changing event. To a billionaire, a $50,000 prize might be just a drop in the ocean. Utility is not linear. If I gave you $1 million dollars today, and another $1 million tomorrow, the utility of the second million is less important. The ‘value’ is the second million is marginally less important as a life changing event than the first. (It’s complex and not precise a science. Different people have different curves for how their utility changes. Because of this, the risk each person will take to marginally increase the utility of their prize is different; there’s an entire spectrum). Imagine these scenarios (You might also like to read my recent article about Risk and Uncertainty). What would you do in these cases? Imagine there are just two cases left. You know that one contains the penny, and the other a million. It’s a coin flip. Would you play on? There’s a 50% chance you’ll hit a life changing million, and a 50% chance you’ll go home with (essentially) nothing. Now the banker offers you a deal on the same situation. He’s offering you $200,000 to buy you out. That’s clearly massively short of the $500,000.005 expected (fair) offer he could make, but it’s $200k sum-certain. Sure you could get $1m, but you could also go home with a penny. Deal, or no deal? How much regret would you feel if you turned down the his offer to find out you ended up with a penny? If you’d not take the $200k offer, what offer would you accept? $250k, $400k, $500k or maybe you are bold and it would have to be an offer of $800k* to make you relinquish your chance of a million! There is no right or wrong answer. It’s up to your needs, desires and risk tolerance. Is going the other way easier? Sticking with the penny and million, if you’d be tempted to take the $200k offer, how low could the banker make this offer and still entice you to take it? $100k? Would you turn down a $100k prize for a coin flip to be a millionaire? How about $50k? That’s still a fairly large amount of money to most people that could change their life? Eventually a threshold will be reached when the reward and the lack of regret will balance. Maybe for you it’s $20k, for your friend $125k. There is no right or wrong answer. That was a particularly extreme example, but what about something with less range? If the difference was between cases containing $200k and $300k, what offer would the banker have to give to persuade you to take his offer instead? Mathematically, you’d say $250k, but would you take just $220k instead? (a 10% premium on the lowest you could, otherwise, walk away with), or would it take more? Would your answer be any different if the choice was between $1.00 and $1,000? It’s a smaller absolute range, and probably below the life changing big value you might consider was a good prize. Would you not give in unless an offer over $800 was made? $750? *You might think I’m crazy to suggest this, but people play slot machines and gamble on roulette wheels with negative expected returns for the chance to win big everyday. From my limited exposure of watching this game, it appears that a typical contestant will enter the competition with what they consider to be a minimum acceptable prize (Let’s say $50,000). If they don’t obtain this, then they’ve failed. But, since they have not paid to enter, there is no downside. If things are going well, great, they are happy with their prize. If things are not going well, they’ll typically take any risks they can and go for broke “What do I have to lose?” This is the where a Banker can be very cruel; he can offer just enough to sell both the dream and the misery at the same time. Offers that the banker makes seem to be weighed up by the players against the number of unopened cases that are above this acceptable prize threshold. Players plough through the early rounds almost ignoring the bankers poor offers then start to pay attention as the number of remaining cases with prizes exceeding their threshold starts to worryingly diminish. So long as the contestant can continue the game without significant risk of knocking out all of the prizes above that minimum, they appear to do so. What the contestant considers satisfactory may change during the game as the remaining prizes change. You can almost see this realization happen on people’s faces. When people play the lottery they know the odds are not in their favor. The expected outcome of every lottery game is less than $1.00 for every $1.00 (the company that runs the lottery needs to make a profit, so even if you purchased every single ticket, and win the grand prize, you’d be losing money), yet people still buy tickets? Why? Because when you buy a lottery ticket, you know that the chances of winning are incredibly small, yet there is a chance you’ll win, and you picture yourself in that position. Watching people on the TV Show, they are living their dream. Because the expected value is the average, as you are revealing cases, any eliminated case that has a value below your current expected value increases your position. So, if you are already at $60,000 expected value, don’t sweat it if you eliminate a case worth $50,000. Doing so will have increased your potential payout (evil Banker notwithstanding). A consequence of this is that as long as there are a few high value prizes still on the board, the smaller values (the ones on the left), are all so trivially small that that the elimination of the $0.01 has not much more impact than elimination of the $750. The graph above shows the distribution of these prizes. The red line shows the expected (average value). It's the area of the blue bars that represents the value in the game. You can see the dominance of the larger prizes clearly. The similarity of the smaller prizes (as long as there are larger prizes still in play) is also obvious. Finally, here is a table of the possible range of expected values at the end of each of the rounds. It represents the extreme possible range of values that could be obtained if the best/worst cases were eliminated up until that point. That's quote a spread, even on the first round, and gets progressively (much) worse! Remember, these are the extreme expected values. That the banker elects to offer is up to his devious mind!